The old man took my harp and accurately picked out a piece by ear. Then he started talking about instruments and music he’d played. I’d gone with our harp group to Boarbank Hall Nursing Home near Grange-over-Sands, where we play twice a year. Moments like this, when the residents chat with us after we’ve played, are the most rewarding part of the experience. When people talk about their past, everyone has something to say about music. Often, sadly, there’s a regret about opportunities not taken or instruments abandoned. As I grow older, I recognise that the investment my parents made in piano lessons was a truly valuable one. When I was nine, they asked for a recommendation of a good local piano teacher, and so I found myself in the sitting room of Miss Dorothy Gouk at 97 High Street, Montrose, playing a piece called ‘Hello Middle C’. Miss Gouk was recognised as an excellent teacher. She was in her sixties then and still teaching. I do not think she ever stopped until, sadly, she died of a stroke in 1972. She smoked the occasional Rizla roll-up, and I’d watch fascinated as she’d demonstrate a piece and smoke at the same time, the drooping cigarette held tightly in her lips. The cigarettes were always tinged with pink lipstick. Her black spaniel, Biddy, gnawed at a chewstick in the corner, not necessarily in time to the music. I had a weekly practical lesson of half an hour and a Saturday morning theory class which extended to a full hour. She evidently considered the theory important, and she was right. 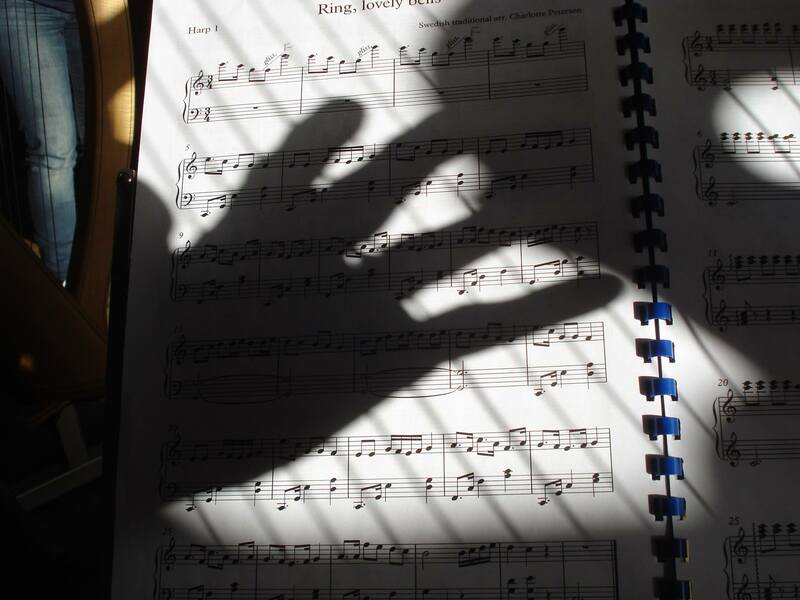 We worked in a group of six and learned about everything from key signatures to cadences. She had some silent rubber keyboards, just over an octave in length; we each had one to help us count out the intervals silently and jot our answers down in the workbook. I think they were called ‘dummy keyboards’. My extensive googling on the topic has yielded no evidence of their existence today. We actually found their silence quite boring, but they were pleasantly squishy and gathered the odd bit of graffiti on the back as they were quite receptive to the point of a pencil. Over the years I progressed from ‘Hello Middle C’ to Grade 8, which I took in my penultimate year at school. The results were always published in a small corner of the local paper. This was a more modest age, and my parents would have certainly disliked the current vogue for announcing results to the world on social media. Praise in a Sixties Scottish household was limited to the odd nod or remark that it was ‘nice’; we were never encouraged to show off. Playing in our sitting room, I was in direct competition with my father, who thundered on a manual typewriter in the room above me. Sometimes he stopped, because he did quite like the Mozart sonatas. Back then, piano lessons were seen as a useful accomplishment which might enable me to stand in occasionally for the church organist or play ‘The Grand Old Duke of York’ and other favourites for the Sunday School Party, both of which I did. Quite nicely. I thought I had taken my last music exam in 1969, but I was wrong. After taking up the lever harp in 2008 I did Grades 3 – 6, and I have just taken my Grade 6 singing exam. I found the exams more nerve-wracking than I did in the Sixties, but I recognise that they have really helped me focus my learning. I am particularly grateful for the hours at the dummy keyboard in the theory class which meant I had Grade 5 theory in the bag; without this qualification I couldn’t have done my Grade Sixes in harp and singing. So I advise anyone to stick at it through Grade 5 theory if possible. 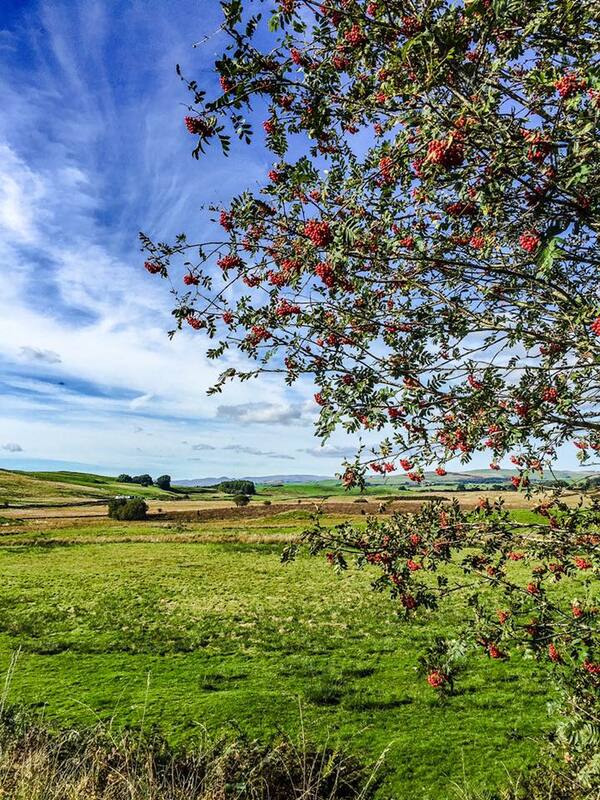 I advise you to stick at it, full stop – even if you don’t do exams. Because exams aren’t everything. Some of my best musical times have been singing songs learned by ear in a community choir or trying to play my harp in a ‘session’. Music will provide you with a link with others all through your life. I have always sung in choirs and have met so many people through making music. At the end of June our harp group played in a community concert for the Silverdale and Arnside Arts Trail, where everyone from schoolchildren to more senior citizens played their part, finishing up with a rousing rendition of ‘Thank you for the Music’. It’s all about the harmony. 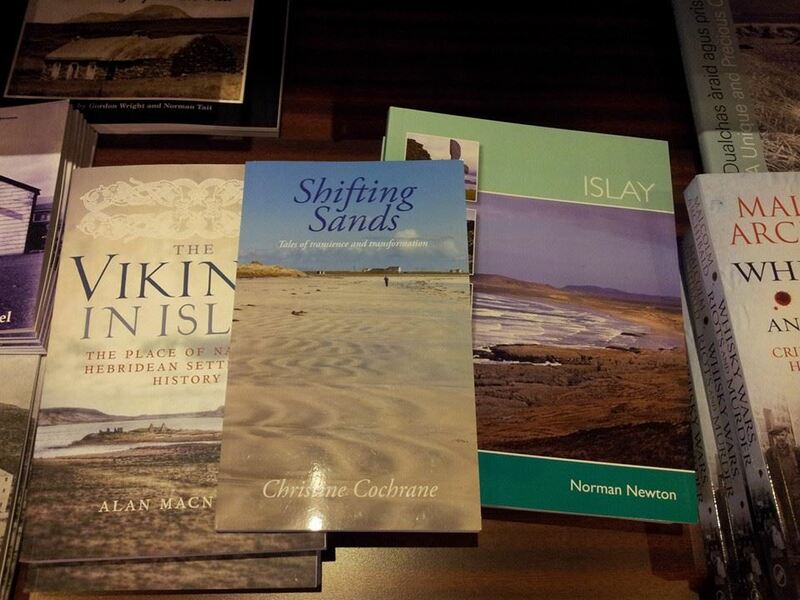 Music has provided me with a major ‘retirement interest’. But what I really notice is that musicians don’t retire. 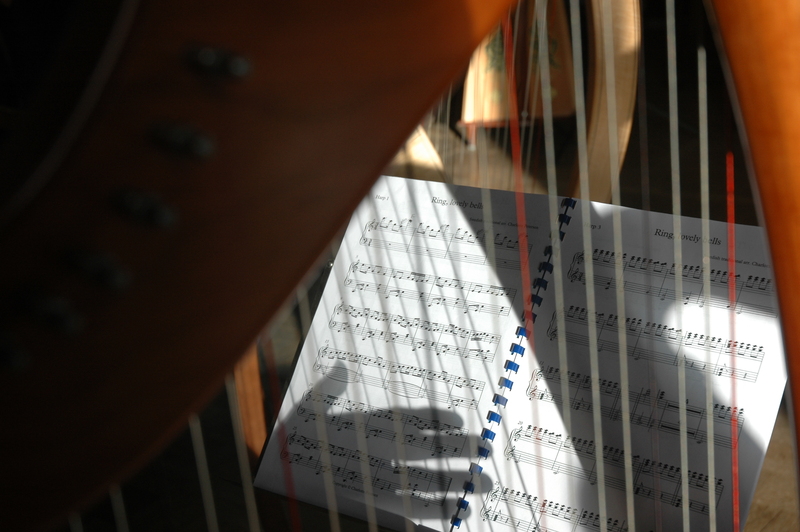 It’s finally time to have a blog post about harping. I seem to have done a lot of it as Christmas approaches, culminating in Harps North West’s fine Christmas Party and Concert yesterday. Six years ago I didn’t harp at all. 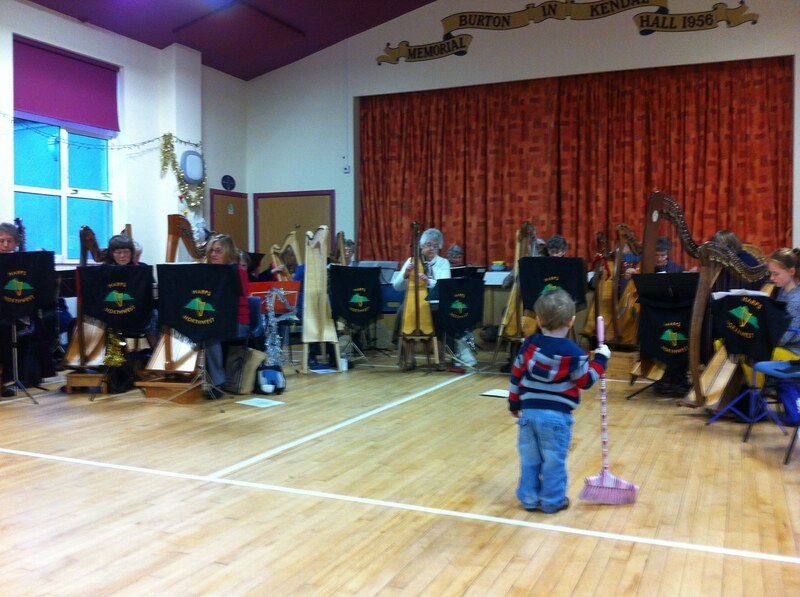 Someone suggested a beginners’ workshop with Harps North West might be fun, and I went along. Instantly hooked, I embarked on an intensive series of workshops and lessons, culminating in achieving Grade 6 on the instrument. After that the exam pieces just started to get longer, so I decided to call a halt on this and just enjoy the music. I already played the piano, which helped the learning curve. Harps North West http://harpsnorthwest.org.uk is a charity promoting appreciation of the harp in all its various forms – the pedal or concert harp, the clarsach or lever harp (sometimes known as the folk harp), the electric harp and even the cardboard harp, an easy and inexpensive way of making a start on the instrument. 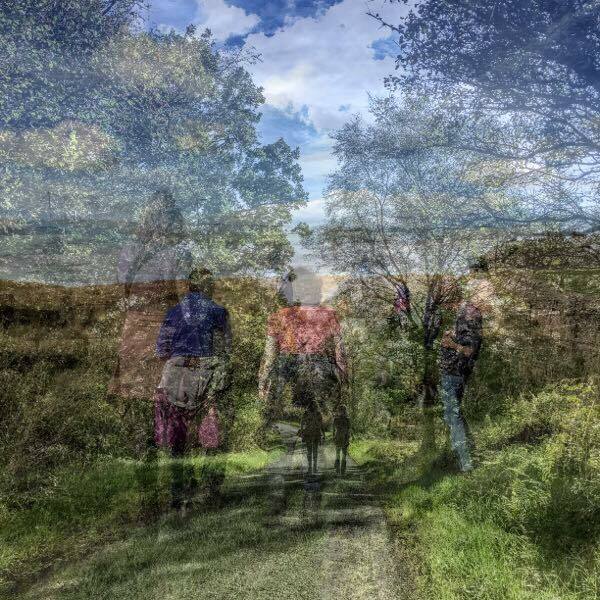 Mary Dunsford, current convener of Harps North West, plays all four and I’d like to thank her for letting me use two of her photographs. Her young son is already plucking the cardboard harp! 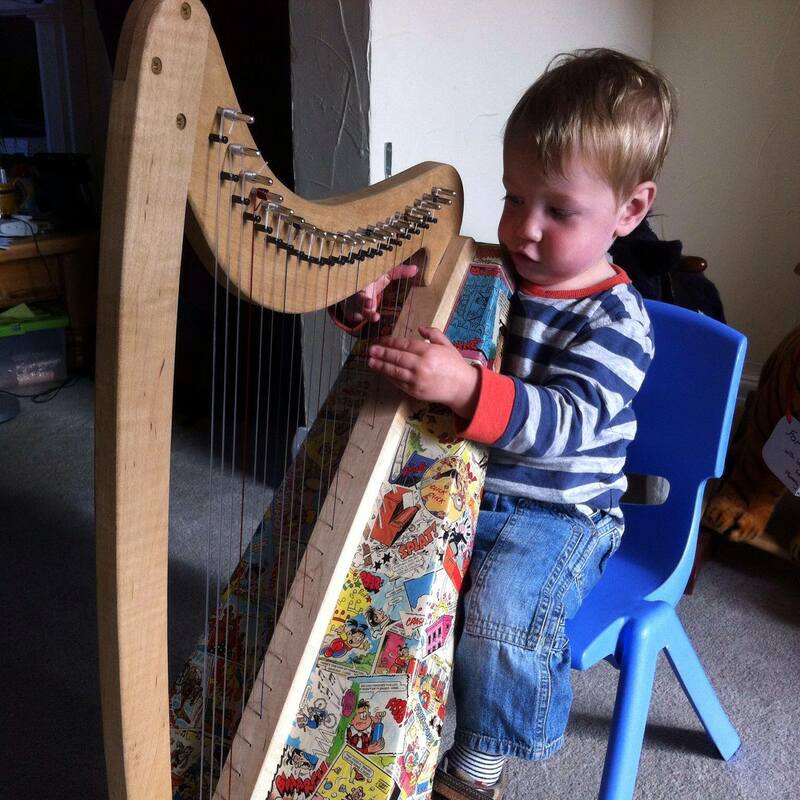 The soundbox on Alfie’s harp is made of cardboard, but it still produces a lovely sound! This harp has been personalised by Alfie’s mum with cartoons from the Beano, all featuring different sound effects – ‘pow’, ‘zzzzip’ and many more. He’s going to be a great player. I play the clarsach or lever harp and, although I’m Scottish, I opted for a Welsh one, beautifully made by Telynau Teifi of Wales, a great firm to deal with. My folk harp, the ‘Gwennol’ (which means ‘swallow’) has a wonderful big sound box and an impressive sound for its size. The levers are used to raise the pitch of each string by a semitone, and before we play a piece we need to set the levers for the key it is in. If you miss one, it’s painfully obvious in the playing… Pedal harpists don’t have these issues as the key changes are all done with the feet. 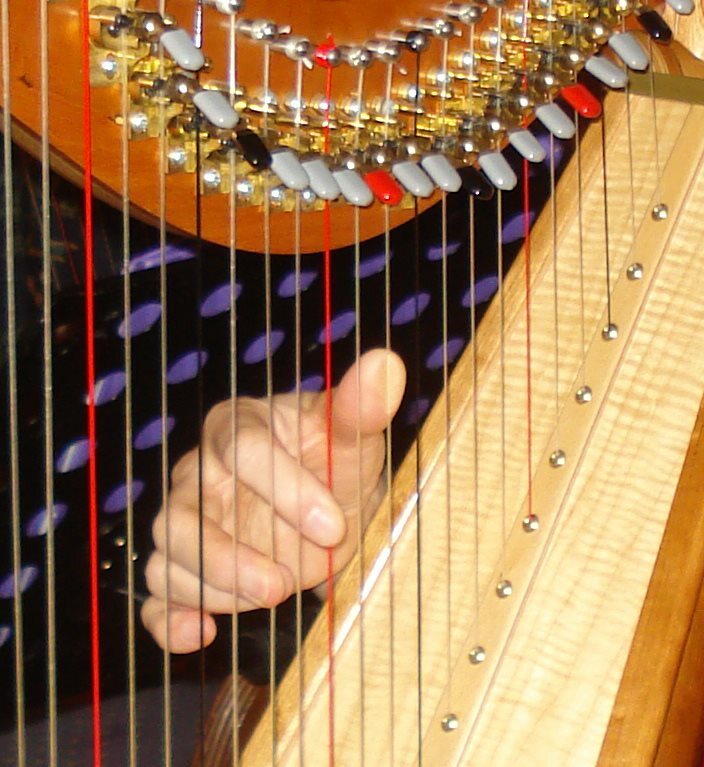 My harp has 34 strings and a range of nearly 5 octaves. Every string has to be tuned before a performance. There were a few surprises for me with harps. First of all, they are suited to an enormous variety of musical genres – classical, folk and jazz all sound good! Secondly, it can be a solitary instrument if you want, but it’s also great for group playing. I was surprised to discover just how many people play this instrument, and how sociable and friendly the harping world is. 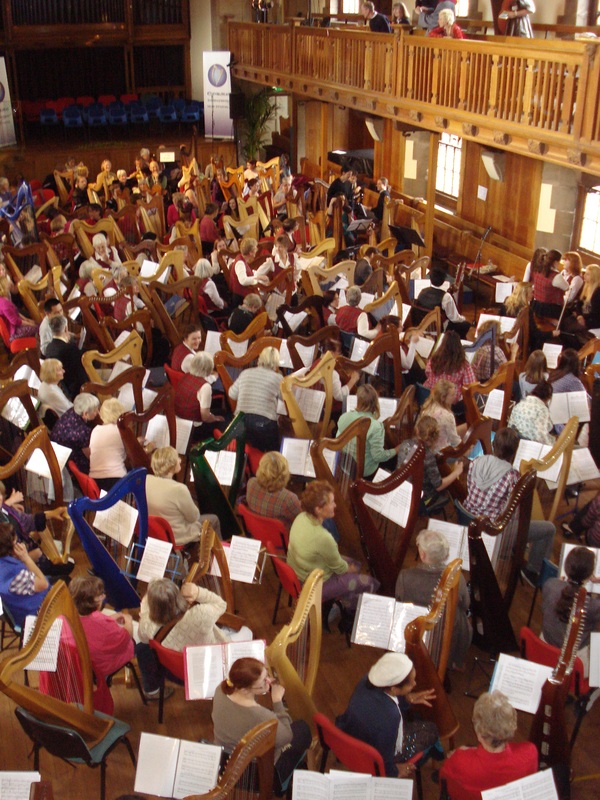 The best place to meet harpists from all over the world is at the Clarsach Society’s Edinburgh International Harp Festival, which takes place every April; there’s an amazing variety of classes, workshops and concerts and you’re run off your feet if you try to do everything. One of the best things I did at the Edinburgh Harp Festival was join 150 other harpists in one concert back in 2011. 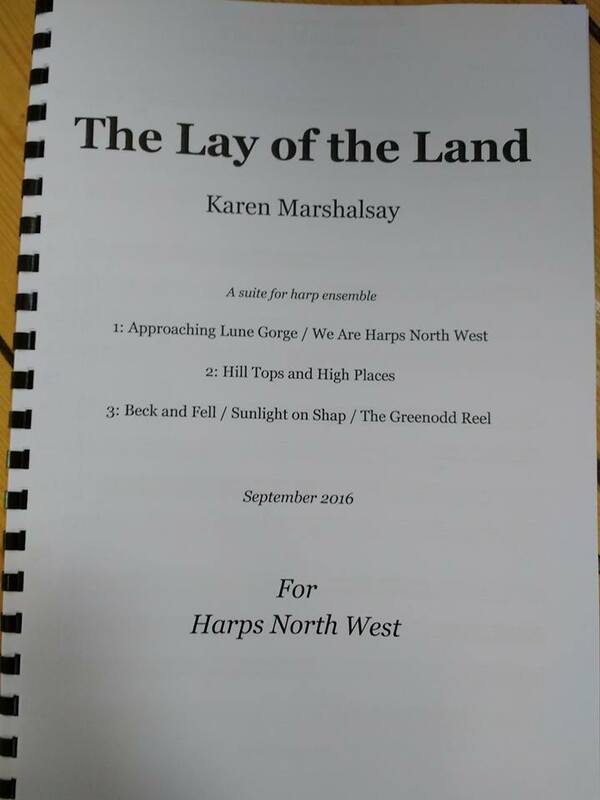 In addition to playing on my own, I play with a small group ‘Harper Four’ and with other members of Harps North West at their regular events. 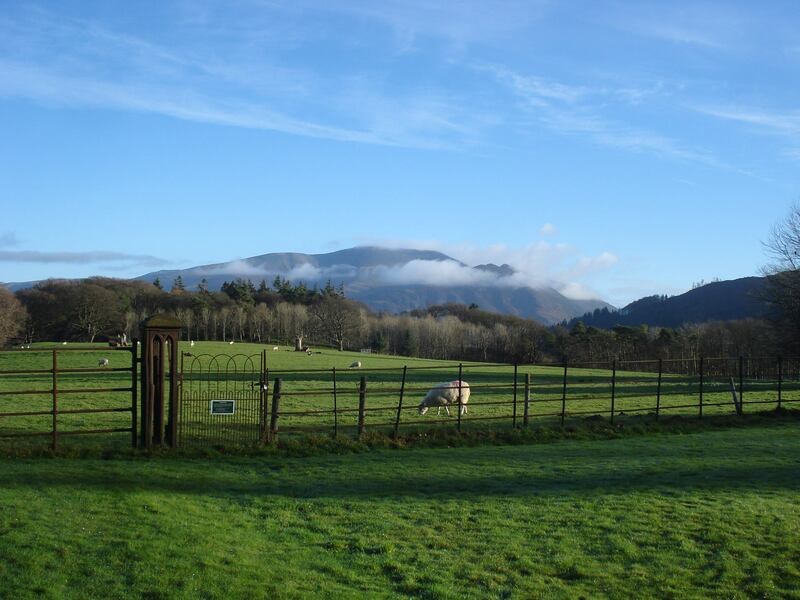 In late November each year Harps North West runs a weekend course at Higham Hall, beautifully set in Cumbria with views of Skiddaw from the front door. This is how it looked on the first Sunday in Advent. 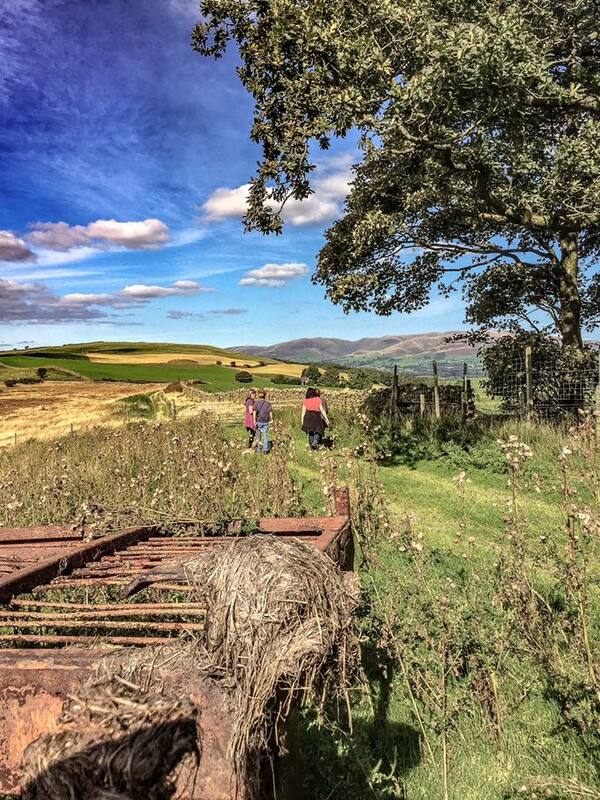 Our tutors for the weekend were Welsh triple harpist Robin Huw Bowen and Charlotte Petersen from Peebles, both well known to us all for their lovely playing and musical arrangements. Robin champions the Welsh traditions on his triple harp (yet another variety of harp, which has three rows of strings rather than levers to give the semitones) while encouraging us to ‘practise, practise, practise’ as an aid to greater speed and dexterity. 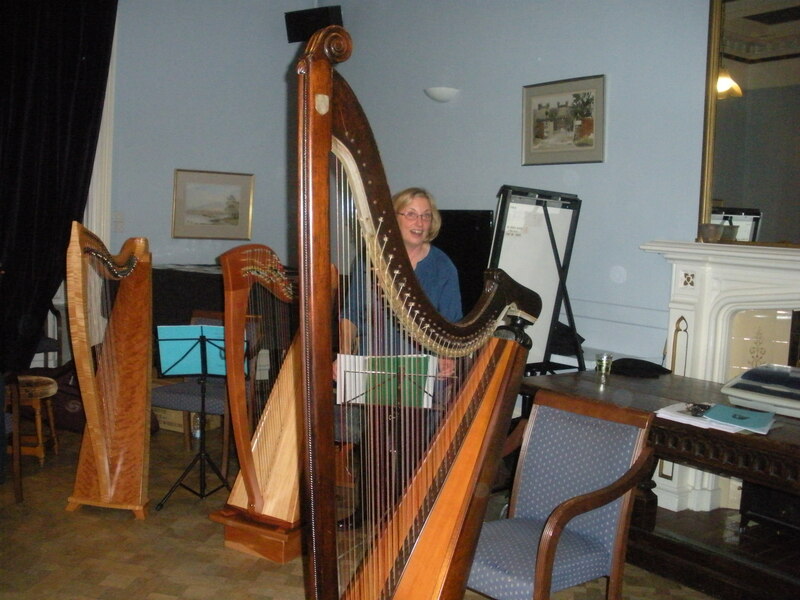 As you can see, the Welsh triple harp is a bit taller than my lever harp. Many of Robin’s tunes are inspired by the Welsh gypsy tradition and his work with Romani Eldra Roberts, who has passed on the melodies to him. Charlotte gave us some haunting tunes from Scotland, Ireland and France, as well as a delightfully jingly Swedish Christmas carol complete with glissandi and bell-like chimes. A reindeer duly appeared on the front lawn. At the Harps North West Christmas party concert participants aged seven to seventy played a selection of group carols. There were also contributions from soloists and our smaller playing groups. One brave young participant played a solo after only six lessons. Alfie had brought his cardboard harp, but seemed to prefer to sweep the floor. Perhaps we’ll hear him play next year! 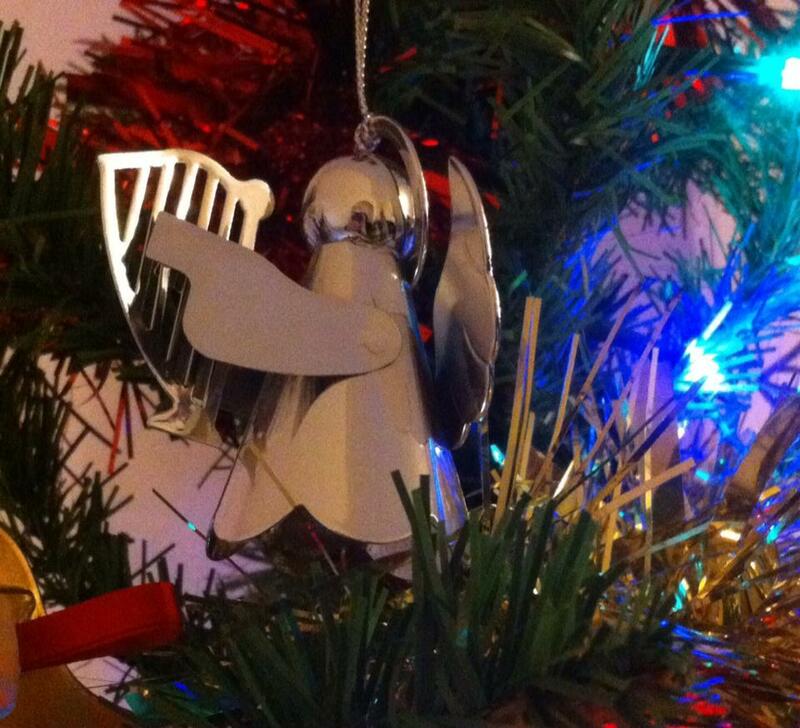 A very happy Christmas to you all from the world of harping! 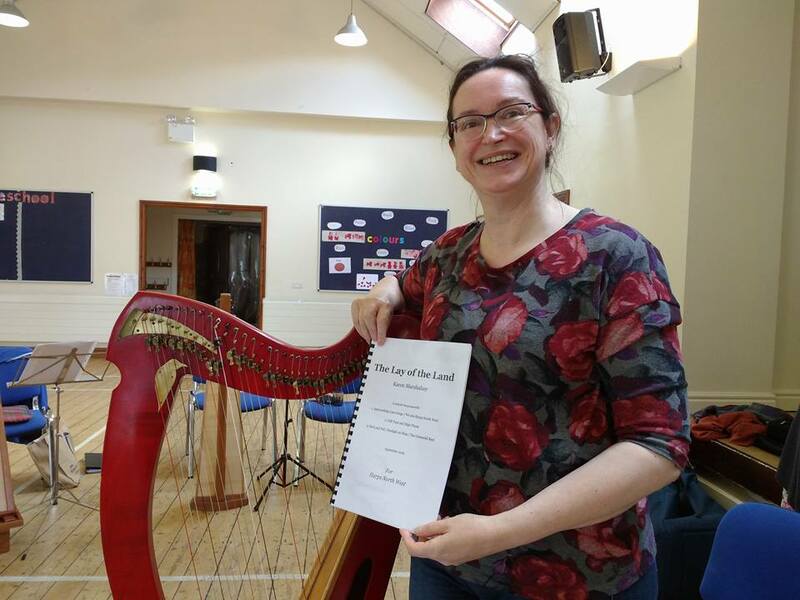 For anyone who wants to try out the harp, there are regular beginners’ workshops with Harps North West and through regional branches of the Clarsach Society. 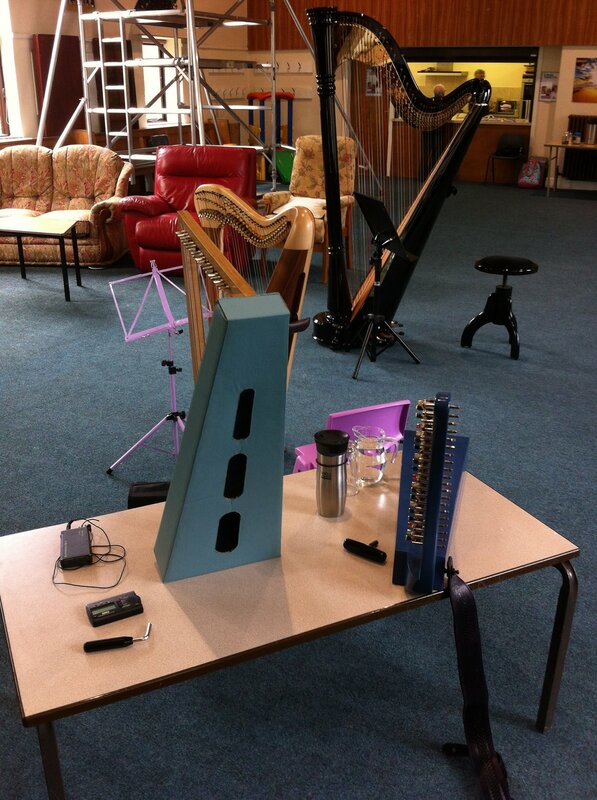 Mary Dunsford also offers sessions on the cardboard harps through Cumbria Cardboard Harp Project https://www.facebook.com/CardboardHarpProject. Go on – it’s impossible to make a bad sound! I’ve just attended a choral workshop on Will Todd’s ‘Mass in Blue’. I’ve sung the words of the mass with various choirs over the years; some masses have been gentle, some loud, some predictable and some surprising. This was surprising. 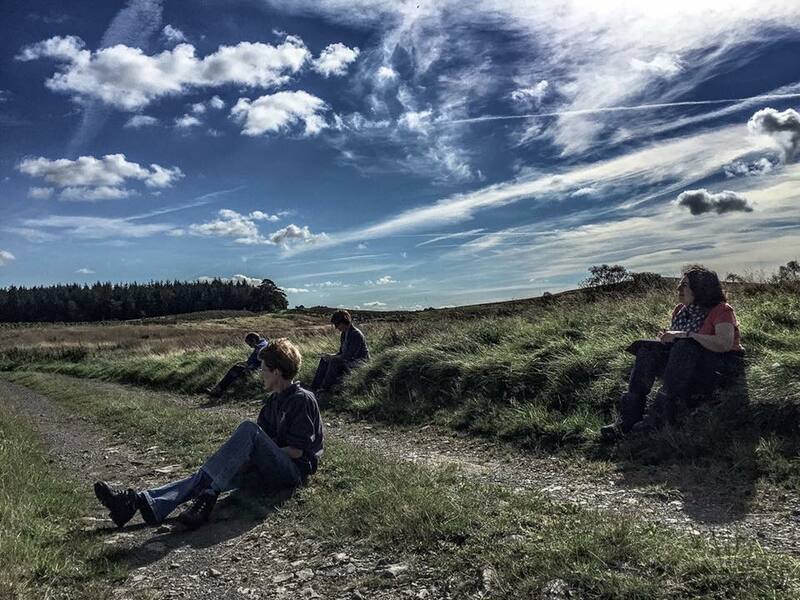 Will’s website describes it as ‘an upbeat setting of the Latin mass for SATB choir, soprano solo and jazz trio or ensemble’. Ralph Woodward, who led the workshop with Will at the piano, soon had us swinging enthusiastically to the beat even if our sight-reading wasn’t always up to hitting the right notes. What was most interesting about the day, though, was having Will Todd give a short talk on his work. He explained how he was classically trained but always wanted to write jazz, and that he was initially dissuaded from doing so by his more traditional university teachers. I don’t know much about jazz, and indeed I would put it low down on my list of preferred musical genres, but I began to change my mind in the course of this day. He explained how jazz has to do with improvisation. When writing a piece in the classical manner, you may have things planned out more and know what’s going to happen. But in jazz there will be surprises. I began to think of the analogy with writing; some writers plan in great detail, others ‘freewrite’ and see where their intuition takes them. Others do a mixture of both, and I think I’m probably in that camp. I liked Will’s thoughts on the editing process; ultimately the most important thing is to recognise the difference between the diamonds and the dross and have the courage to throw away the latter, edit and redraft. He explained how he rewrote the entire Mass in Blue, keeping in one special phrase from the Benedictus, adding ‘when it’s the right thing, it’s easy to finish’. His final advice? Make sure you create with the whole you.